* All of these trees can be left to grow naturally. Those with a "Yes" can also be pruned to maintain a certain size. The following "checklist" is designed to help you get organized to make the right "Instant Privacy” Tree decision. You might want to print or copy this page and keep notes after each question. This will help us work with you to determine the best tree for you. 1. How tall does your privacy screen need to be when it is full grown? 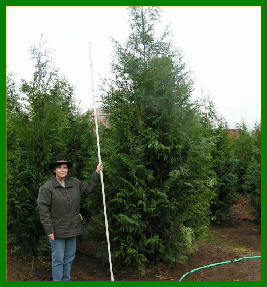 Emerald Green Arborvitae will grow to a mature height of 12’ or so, which is sufficient for most screening. All the other trees we carry will grow taller than that. 2. How many feet in width do you need to cover? You have to know this so you can determine how many trees you need. 3. How much of your yard can you give up for the screen? This is a big issue. 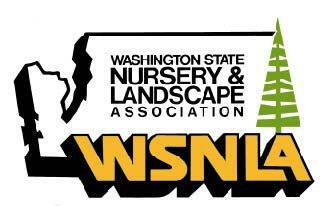 If you have a large yard, any of our trees will work for you. But if you have either a smaller yard or don’t want to give up a lot of your yard to privacy trees, then you need to look at this carefully. 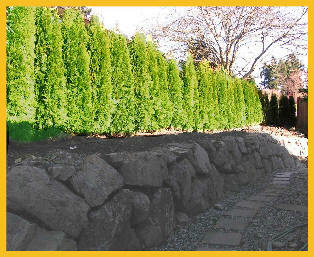 The Emerald Green Arborvitae are popular because they don’t grow more than 2-3’ wide, and don’t require any pruning. 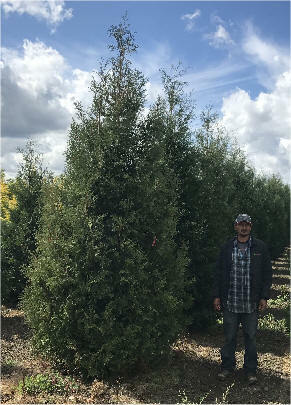 Leyland Cypress and Excelsa Cedar will grow to be 12-15’ wide, English Laurel 20’ wide, and the Douglas Fir and Western Red Cedar can grow as wide as 50-60 feet. These trees can be pruned to stay in a smaller space, but pruning is tough and/or expensive work. 4. Are you willing to prune your trees, or do you want “low maintenance”? 5. Will the trees be up against a fence? If so, you need to be careful about putting larger trees next to it—you’ll either need to leave enough room to get in there and prune the trees (a miserable job), or plant them far enough away so they don’t reach the fence (thus using up a lot of your yard). Basically, big trees will eventually push over the fence if left untended. Here again, Emerald Green Arborvitae avoid this problem. 6. What is the “look” you want? 7. Are you willing to water your trees? Your answer has to be “Yes”; otherwise, build a wooden fence. Newly planted trees need water and so you need access to a water source and a watering/sprinkler system. When we plant the trees we provide, for no additional charge, either a custom-cut, water-efficient dual soaker-hose system (Arborvitae, English Laurel and Bamboo) or a custom-length low-volume emitter system (other Instant Privacy Trees) either of which will attach to your garden hose; and we suggest you buy an automatic watering timer (under $50). 8. What is the soil and sunlight light like where you want to plant the trees? On our Instant Privacy Tree pages, as part of the description of each tree you will see the tree’s “Attributes” explaining its soil and sunlight needs. 9. How “full” do you want your privacy screen to be immediately? Most of our “Instant Privacy” Trees come in more than one size. 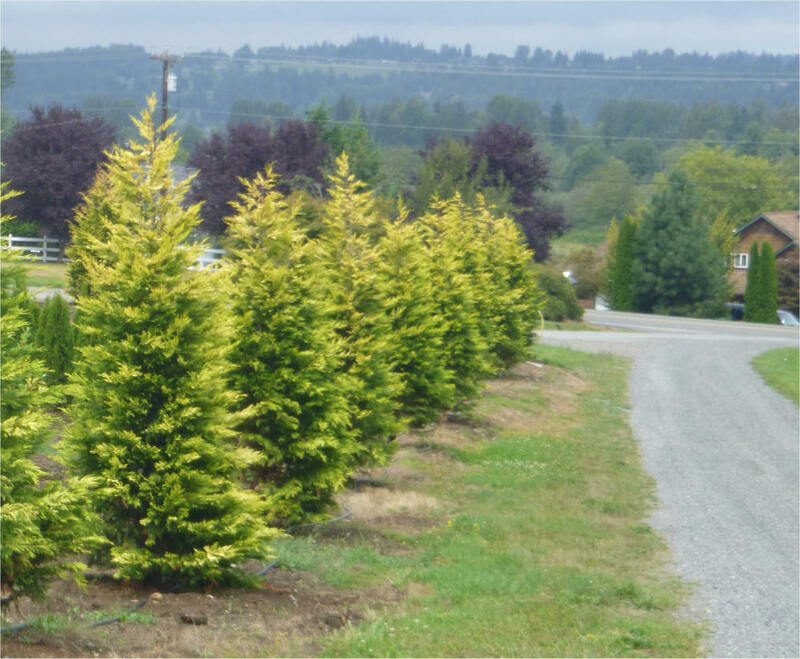 You also have choices as to how you want to space the trees when you plant them—put them close together to obtain maximum screening now, or space them wider to save on the budget and wait for them to grow together. 10. Would you like us to deliver and plant the trees? You are welcome to simply pick-up the trees from us, but most people have us deliver and plant them. These are big, heavy trees. 11. How good is the access to the planting area? When we park our trucks, how far do we need to go to get to the planting area? Are there any stairs, narrow gates, rockeries, etc.? Many of the trees we plant are so large that we need to use equipment to put them in place--do we have "equipment access" to the planting area? 12. 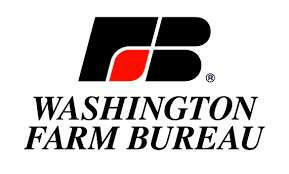 Are there any utilities or irrigation systems in the area where we will be planting? This is usually not a problem, but the question does need to be asked. Your area will have a "one-stop" phone call where you can ask all your utilities at once to come out and mark their location (no charge). 13. Are there any governmental or private restrictions on planting trees where you'd like to? This is usually not a problem but there can be governmental height or type restrictions, particularly in parking strips. Also, private covenants can dictate what can or can't be planted. 14. Where can I go for more information? 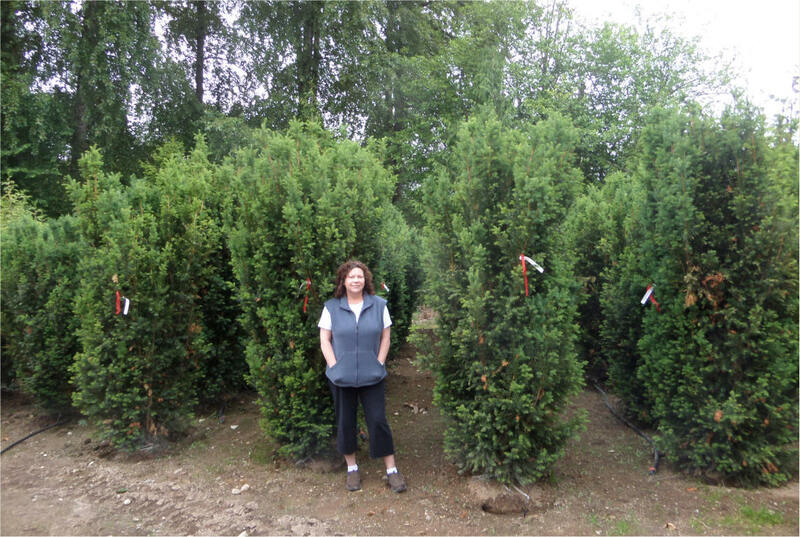 You'll want to look at our "Instant Privacy" Photo Gallery, and if you're interested in Emerald Green Arborvitae, see "Everything You Need to Know about 'Emerald Green' Arborvitae". We’d be happy to discuss the options with you over the phone or by e-mail. If you wish, we’ll send you a free, no-obligation estimate of what your project would cost and when we could do it. We also have many happy customers who have agreed to act as references for us--names available upon request. Easily compare the mature sizes, growing conditions, etc. of all of our privacy trees. with "Before & After" photos. 3. 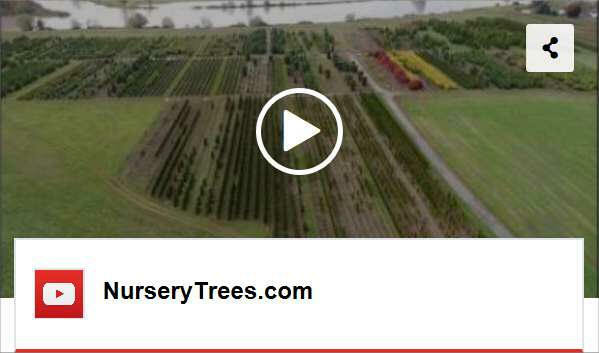 Video of NurseryTrees.com's farm property, including trees labeled. 4. Request a Free Estimate (no cost or obligation).